Matter Meltdown: Can you mix the correct elements to break all of the tiles? Carlos the alien just crash landed into an unknown galaxy and he needs YOUR help exploring and collecting enough Matter to power his ship home. Mix elements and break tiles to collect all of the Matter on Earth! 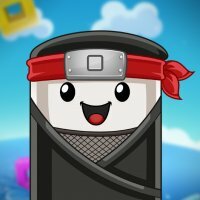 Landslide Ninja - climb up the avalanche of blocks! Set in an unknown universe with five vastly different planets, players attempt to climb to the top while colorful blocks come smashing down. One wrong move and the colorful blocks become your biggest threat squashing your marshmallow-like character into oblivion. UNLIMITED play Unlock & collect many different exciting outfits Explore vast environments Level-up your ninja & unlock power-ups FREE to play High-quality & original soundtrack and SFX PLEASE Roast me, I can take the heat and I can dish the heat! ∞ How to play?Place the vortex on the board. All the blocks that are the same colors will be sucked to the vortex. Place it in the right place to get the ball into the hole. Sounds simple right? It is if you’re smart enough!∞ Highlights:Easy to play, hard to master. You can enjoy this brain game anytime, anywhere, for as long as you want to play!This is the most interesting puzzle game you have ever had in your hands!It gives you the power of the stars and gravity at your fingertips.It is also the most advanced way to train your brain and keep your mind sharp!Are your smart enough? Very interesting, the level design does look a bit simplistic, but maybe it gets more complicated as it goes. The graphics are neat, it looks like it has a very cohesive aesthetic. I like the upbeat cheery music. The enemy design is nice, but I feel like there could be more variation. These game graphics are adorable, I think that the art style alone will carry this game to a good spot, how long has it been out? I do think that the harsh learning curve is going to hurt you in the long run, most users on mobile aren't interested in a challenge. I've released super simple games, even one touch games, and people have said that it's too hard. As a developer, as a mobile gamer, as a pc gamer, I really enjoy your game and think it is very unique! The character could use some facial animations when it dies maybe. The boss battles are really cool, if you named them it would be cooler than B1, B2, etc. I'm about to post my game here if you want to roast it. Search for Landslide Ninja in a little bit! I really like the the art style and how simple it is, my gripe with it is that it needs more color. I can't play games that are all gloomy like that. This is the same reason that I installed re-shade on PUBG, that game is way too gloomy! Obviously this isn't the way everyone feels but it would keep me from wanting to play your game again. Overall decent game but my problem with it is that there are 50 more games of this style in the marketplace right now, I don't know what the genre is called maybe "gravity jumpers"? or "planet hoppers"? Unless this is your first or second game I recommend trying to think of something a little more unique or if you're going to enter into an existing type of game, move the bar up. Best of luck with your game! I'm keeping it installed because it's really cool and unique! - The puzzles are really unique and make me want to keep playing until I figure it out! - I like that you also use GameMaker! Yeah the character is a bit "floaty" but it is intentional. I think maybe what you're doing wrong while controlling him is that you're not tapping and holding on the correct side of the screen. The left side will move your character left, and the right side will move your character right. Try it again with that in mind and let me know if that helps. Please email me info@eternalgamestudio.com, happy to answer any questions you may have :) I'm online now. 2. Why isn't this full screen? 5. I feel like this framerate is terrible, anyway you can get me 60fps? 6. The UI is confusing at the bottom. I have m31, what does that mean? 7. Tutorial is not exciting. I think the issue you and a few others are having is because you can't just infinitely jump up, you get more jumps every time you touch a block. Pay attention to this and let me know if this fixes this issue. IF it is, I will add something to the tutorial to explain this better. 1. Thank you! We love the ninjas too! 2. I think the issue about not registering taps is because you need to touch a block to get more jumps. I think level one is only a double-jump and you must hit a block to get your two jumps back. This was done so that you can't just fly upwards infinitely. As you level up you unlock triple-jump. Keep this in mind and let me know if this fixes your taps not registering issue please. 4. We have thought about starting you at the zone you reached but decided against it, instead we did a couple things: at level 5 you unlock a "catch your ghost" ability where if you get crushed, you can catch your ghost once to continue where you were. We also allow you to restart at that zone for 10 shurikens one time per run, is 10 shurikens too expensive for this? Maybe we could implement a special portal that could be used once an hour or so, that teleports you to your furthest zone? 5. Thank you for complementing the rope, feels good when you break it! 6. You can break the blocks after you hit level 2! Later levels allow you to break the blocks more efficiently! Thanks again for all the awesome feedback, this is the stuff developers need! Wow that is very unplayable! Thank you for reporting it to me. Did you see that feature on Apple App Store (United Kingdom) man?? It's under "Games We Love" and i'm right there with you!